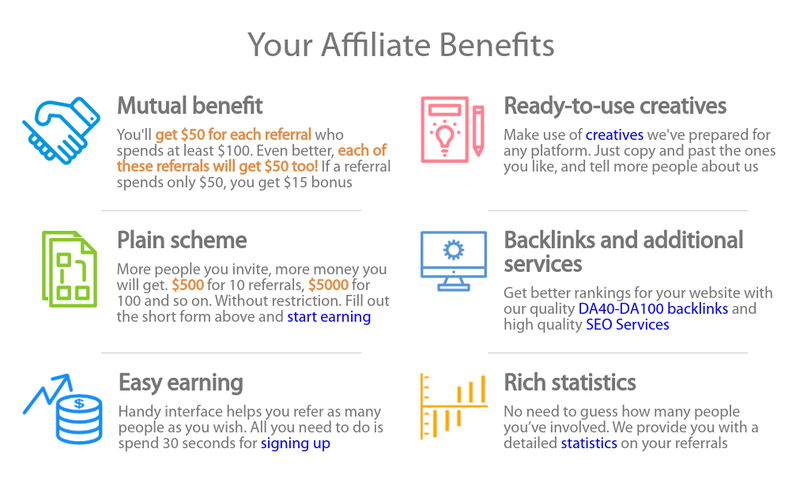 Discussion in 'Affiliate programs - CPA networks' started by LinkBuildingServices, Sep 16, 2016. Is there a limit ot how many friends you can refer? What will you see after the sign up? You will go to the Dashboard and choose one of the three referral programs you can join. When you sign up and join this referral program you will get $50 for every referral who register using your referral link. Hi, thanks for this. I want to know if you will get paid whether the person who invited spends or not? If we got you right, you are asking about the money spend by a referrer. Actually it does not matter as the main thing is that a person invited by you i.e. referral spends money. So as more you refer the higher commission you get. still work i can drive alot of traffic? It would be interesting to find out which features you like and dislike in referral programs. Will you share? Do you still think that referring people is tiresome and time consuming? Click on the image to sign up within 2 minutes! Thanks for the post. It is a good and very easy way for the reader for earning money. It would be really nice of you if you post the link of the site. I would really appreciate your offer. I would also like to know how could I receive my money. Thanks and waiting for your reply. Use direct link to register and start earning. You'll be able to choose the best option that suits individually for you as we offer opportunities for SEOs, link builders and website owners. Let us know if you want to find out more details. you can share your referral link via email in 1 click! What's next? What will you see after the signup? You can share your referral link via any resource - email, banner or via social media.